Cold Air Currents: What's worked to cut greenhouse gas emissions, and Klein, etc. 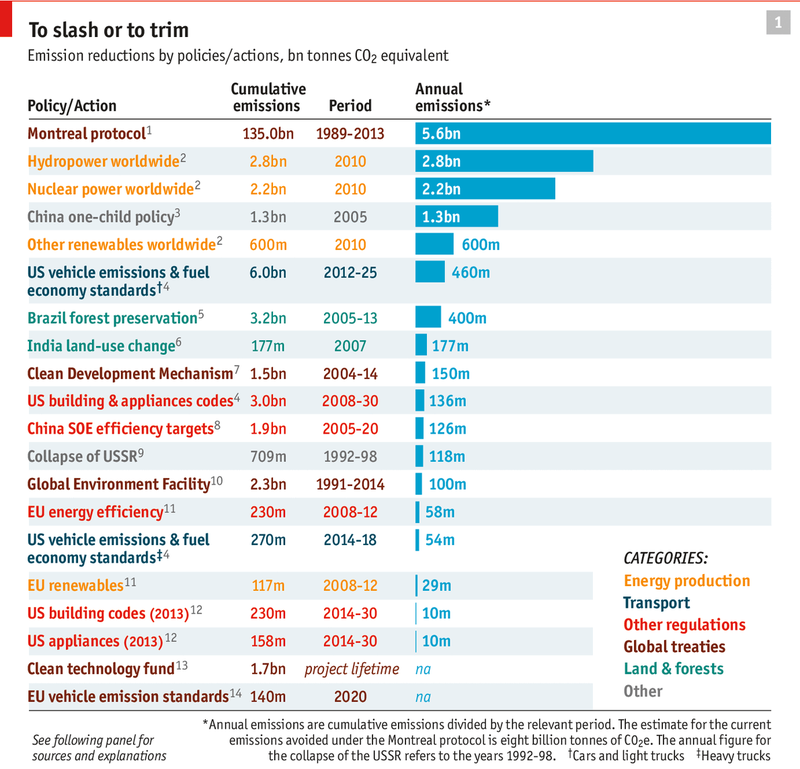 What's worked to cut greenhouse gas emissions, and Klein, etc. Apparently there's going to be a parade, or a protest, or something in New York this weekend which caused Torontonian Naomi Klein to release a book that's getting lots of attention in prospective marching circles. The Economist does a good job, with the graphic, of reminding people that standards accomplish things. So to, it seems, do big capital intensive projects. ON SEPTEMBER 23rd 120-odd presidents and prime ministers will gather in New York for a UN meeting on climate change. It is the first time the subject has brought so many leaders together since the ill-fated Copenhagen summit of 2009. Now, as then, they will assert that reining in global warming is a political priority. Some may commit their governments to policies aimed at reducing greenhouse-gas emissions. What few will say is how many tonnes of carbon dioxide these will save—because they almost never do. According to scientists, cutting carbon-dioxide emissions is an essential part of reducing catastrophic risks from climate change. Yet governments are persistently averse to providing estimates of how much carbon a policy saves. That may be because, in countries where climate change is controversial, it makes more sense to talk about the other benefits a scheme offers rather than its effect on carbon. Or it may be that, in countries which are enthusiastic about renewable energy, pointing out that it may not save that much carbon is seen as unhelpful. Or perhaps governments think climate change is so serious that all measures must be taken, regardless of cost (though their overall lacklustre record suggests this is not the case). I feel obliged to note some of this Naomi Klein nonsense - which I've read more of than I care to admit, and communicate on it only to discourage others from wasting similar time. I noted, on Twitter, these "globalization wars" raised many out of poverty - which isn't something we saw from "World" wars of the 20th century. I don't encourage my readers to continue reading Klein's Globe article, but if you've been exposed to Klein's work, I've seen many comments about the usually excellent Will Boisvert's Why Progressives Should Reject Naomi Klein's Pastoral Fantasy — and Embrace Our High-Energy Planet, which might be the antidote needed. 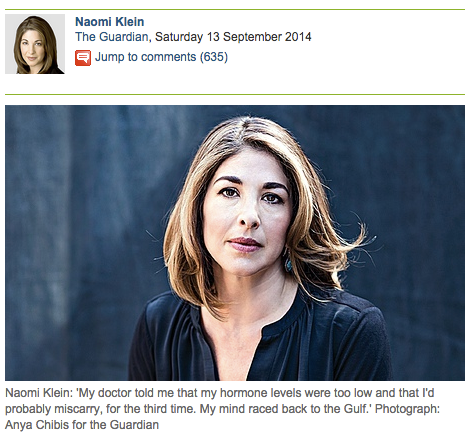 The Guardian carried an article by Naomi Klein, with an equally uninteresting beginning, although this time the fault may have been the Guardians' editors. The caption to a picture of the Toronto writer includes, "My doctor told me that my hormone levels were too low and that I'd probably miscarry, for the third time. My mind raced back to the Gulf." Neither my mind, nor my eyes, were racing to the text below after that. ...we live in a permanent terror film and every day they [ecologists] explain to us that it is a miracle that we are still alive. “The absurdity of this propaganda of fear – which recalls that of [former US president] George W. Bush regarding terrorism – is that we have never lived so long. “We are living in a post-technological Middle Ages. Our mentality is that of the medieval peasant serf who sees maleficent forces in nature. “Everything is dangerous. Simply to live has become an impossible task. Intelligent responses to environmental degradation are therefore required rather than radical “belt-tightening” and “privation” in the form of a retreat from nuclear power and even domestic heating. “There is this famous notion defended by the ecologists of ‘negawatts’: the best energy is that which we don’t expend,” the philosopher almost sneers.